So after crunching some more numbers and reading the green peace green energy guide I decided to change electricity retailers. 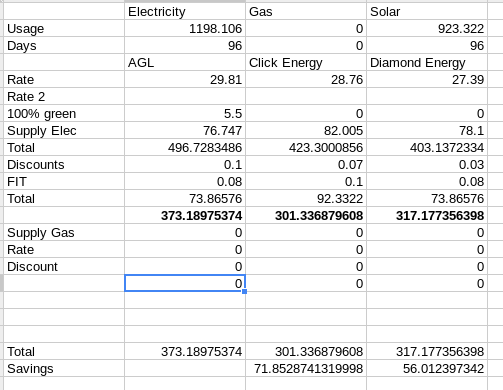 Based of my need for a high VFIT (see previous post ) it was a choice between AGL (current provider), Click Energy and Diamond Energy. Ok so the savings it’s not completely fair on AGL $55 of that $70 saving is 100% green energy which I’m not longer buying. As click doesn’t offer it on their solar plan. but i can buy green energy from the a environmental trust for 4.2c/kWh and it’s a tax deduction. Click saved me the most money has no contracts over AGLs 3 year killer and Diamonds 1 year one, it was also rated by green peace as middle range green. I’ve decided to move to click energy I’ll officially switch at my next meter read. If I’ve convinced you to switch and you want to get $50 click has a mates rates referral program drop me a message and we’ll go from there.